There has been a murder at Boggy's Bog, a tourist attraction built around the legend of Boggy himself; a creature akin to Bigfoot or the abominable snowman. The founder of the business, Mr. Remington, was found dead with attack wounds that implicate Boggy in the murder. As Detective Grimoire, it is your job to travel to this bizarre tourist attraction and solve the mystery of this crime and the legend of the creature, not seen in sixty years. There are several different mechanics in Detective Grimoire which you use to collect clues, question suspects and get to the bottom of things. 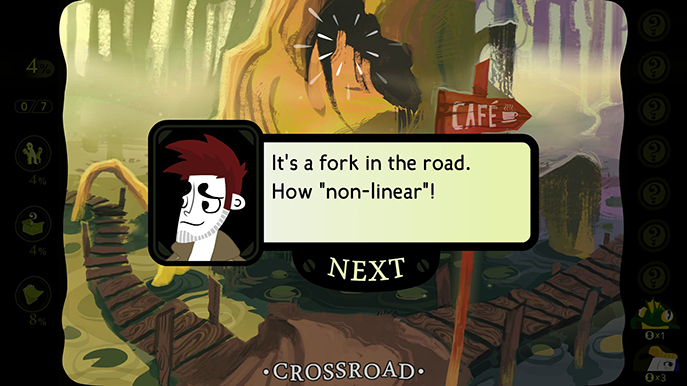 Each location is presented in a single screen. You can click on anywhere in the environment to have Grimoire take a look at it, making a comment that could potentially be a clue, or discover something hidden. 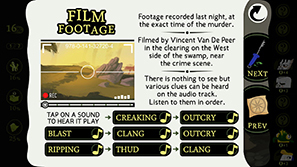 An audio cue plays every time you find something or anyone says something important so you'll always realise when you've discovered part of the puzzle. Occasionally when you'll click on something important a short puzzle sequence will initiate, though these lack any real challenge. 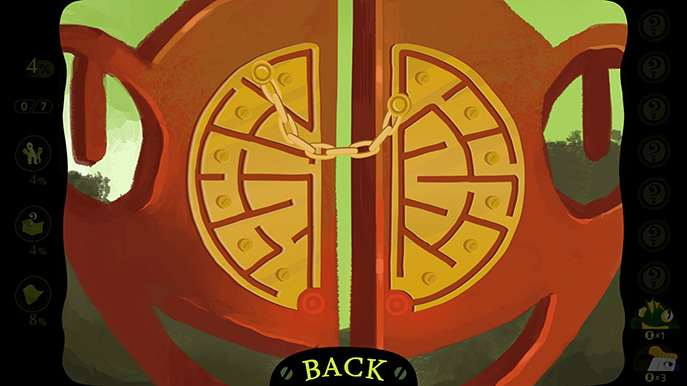 They resemble the kind of puzzles you got on the back of children's placemats at restaurants; out of the six tangled vines which one holds an item or guiding a chain through a maze to unlock the door. This is all very simple stuff. 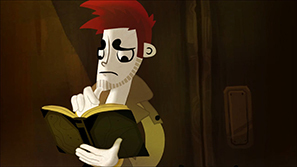 Detective Grimoire has a lot of charm and this is greatly thanks to the writing and animation. You'll come across several characters while you investigate the small tourist attraction. These are all, of course, suspects and you have to question them on their whereabouts at the time of the murder. Each character has a secret or two and it is a lot of fun discovering what these are. There is great variety in the personalities of these characters and they are all animated and voiced very well. You have several conversation choices; asking about their job and where they were last night (when the murder took place). Once you've gathered enough information about a certain character that contradicts something they've previously stated you are able to challenge them. This begins a conversation where you need to recall your evidence and choose the correct response from three. A successful challenge will provide you with information that will bring you a step closer to solving the case. You'll recover a considerable number of clues during your investigation and you can present anything to any character to see if they have any further information about it. While some of the time it is clear what you need to show who, I found later in the game when I had everything I was ultimately showing everything to everyone. This was a little tedious and time consuming but got the results; results I'm not sure I'd have found otherwise. There is also an option to present a profile; a dossier of the suspects on the island and enquire about that person's relationship with them. Finding out about all the people in Detective Grimoire is one of the most enjoyable parts of the game. The art is colourful and excellent throughout, with watercolour style backgrounds with subtle animated parts. There are a number of cutscenes which are equally well animated, though the resolution looks low – even on a handheld device. The music is sublime. It reminded me of Danny Elfman's more playful compositions and accompanies your time on Boggy's Bog very well. Detective Grimoire took me about two and a half hours to complete and I collected the vast majority of clues and evidence. 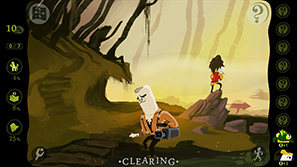 At no point is the game particularly challenging, and if you do get something wrong it is entirely forgiving; letting you restart the segment with no consequence. The numerous puzzle types are all incredibly easy too. There is a glowing hint system that spells out clearly what to do. This (thankfully) can be turned off in the options and I suggest that you do immediately. The game is easy enough without it. I found the chapter pacing a little obscure as well. The first chapter took me around forty-five minutes to complete, then the second two minutes. Later on in the game they zoom by. Detective Grimoire is more about enjoying a murder mystery than presenting the player with a challenge and fortunately the narrative is well written and fun to play through, though a little predictable in areas. Its length ensures you don't get burnt out on the small location and lack of challenge. While the UI is designed more for ease of use on a touchscreen it does not hinder play on a PC. It remains easy to navigate with a mouse. The price point is fantastic for this quality of game and if you enjoy adventure mystery games I'd recommend picking it up.